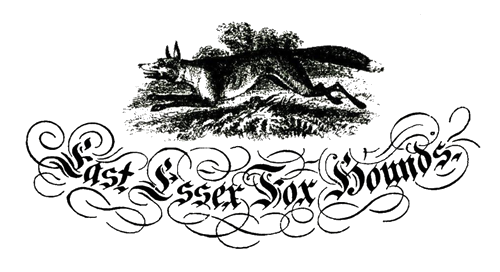 The East Essex Hunt dates back to 1820, with the first recorded Master a Mr.Charles Newman, of Crix, Nr.Kelvedon, where hounds were also kennelled until 1891. Mr.Walker Grimston was Master then, and built kennels at Earls Colne on his own property. The existing kennels were built in 1936 on an adjacent site. The East Essex are a small, friendly pack of modern foxhounds, who, since the ban, regularly hunt a trail two days per week. We hunt Tuesdays and Fridays/Saturdays, subject to our Landowners permission. Newcomers are always welcome, and we try to ensure one of our regular members ride with you to show you the ropes.